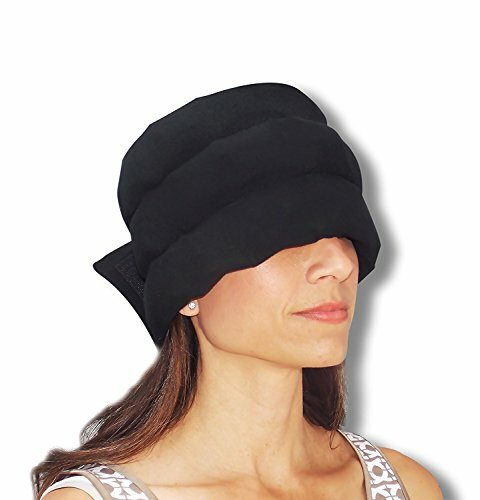 The original headache hat, also known as a headache halo, is a wearable, cooling therapy for migraine headaches. The patented, lightweight and flexible wrap design makes this ice wrap the best relief for all kinds of headaches. Real ice cubes coated in thin plastic layer provides long lasting relief without having the water melting on you. 24 ice cubes (8 in each of the 3 rows) are individually placed in a flexible cotton polyester blend wrap band, and can be moved and wrapped around the head right out of the freezer, or refrigerated for a cooling relief. Wear while working around the house or laying down. The wrap design looks like a hat when worn, but allows for ultimate versatility compared to an actual hat. Can be worn pulled down over eyes, from back to front, around neck, draped over the crown of head, or open to lay down on. Headache hat comes with Freezer Storage Bag and Fleece barrier for temperature control! Standard Size is best for heads that measure 21 - 23 inches. Measure with a tape measure around your head, just above your ears. If you have any questions about this product by Headache Hat, contact us by completing and submitting the form below. If you are looking for a specif part number, please include it with your message. Theraworx Relief Fast-Acting Spray for Leg Cramps, Foot Cramps and Muscle Soreness, 7.1oz.